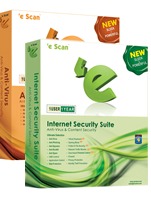 Complete Antivirus Solution for Windows based home users. eScan Antivirus solution designed for the home users is a comprehensive Antivirus, AntiSpam and Content Security solution that provides zero day protection to personal computers from Virus, Trojans, Spyware, Adware, Rootkits, Phishing and many more information security threats. eScan v10 provides you with a user friendly graphical user interface that is designed to suit the needs of both the novice and expert users. This GUI offers a single screen access to both the Virus Monitor and the On Demand Scanner. eScan v10 provides a two-way inbuilt firewall that monitors both the incoming & outgoing network activities in the system and safeguards the computer from network based attacks. Scan faster without slowing down your system’s speed - eScan’s new On-Demand Scanner is equipped with the Cache technology that scans faster and is lighter on system resources. It also scans USB drives, Spyware and Adware. eScan v10 provides multi-level protection from Viruses, Trojans, Worms, Spyware and many more Information Security threats using various technologies such as Application Control, MWL Technology, NILP Technology, Endpoint Security, Domain Blacklisting, Firewall, etc. Fearlessly send/receive mails, share files, download files - eScan v10 does real-time virus scanning of files, applications, emails, email attachments and websites using the MicroWorld Winsock Layer (MWL) technology and Heuristic Algorithms. Automatic hourly program as well as definition updates to protect against zero day threats. Windows Based Rescue Disk - Easily create a Windows Based Rescue Disk file with the eScan Rescue File Creation wizard. The eScan Rescue Disk will help you to clean boot your Windows PC to scan and clean infected Windows systems from rootkits and file infectors that cannot be cleaned in the normal Windows mode. Experts available round the clock to solve your queries - We provide round the clock free telephonic and online technical support (via email, chat and forums). Pay once, get it all - Receive 3 user licenses for 2 year so you can use at home, office or your laptop... worry free! Copyright © 2014 InfoBureau.net Co. All Rights Reserved.